The New York Times reports that the Treasury’s stress test has determined that Bank of America needs $33.9 billion in new capital. That’s nearly half the current value of the entire company, which has a market cap of about $70 billion. If BofA can’t raise this money itself, it means either (a) more TARP money or (b) conversion of the Treasury’s current $45 billion in preferred shares into common shares. I continue to think that (b) is little more than a shell game, but better minds than mine have suggested that it would have some genuine value. If that’s what happens, conversion at Tuesday’s closing price would give the government a one-third stake in BofA. But if their stock plummets and conversion happens at a lower price, Treasury could end up with a majority stake. On the other hand, BofA’s chief administrative officer bravely says they have plenty of options for raising the money themselves before they have to strike a deal with the feds. 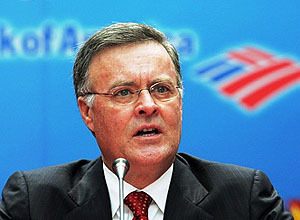 For example, BofA could decide to quickly sell a third of its stake in China Construction Bank, which would bring in about $8 billion. The sale of First Republic and Columbia Management could generate about $4 billion. Maybe. It’s hard to say at this point. But $33.9 billion is a lot higher than anyone’s been talking about so far. Any way you slice it, it’s bad news for Ken Lewis.